The origins of the French Church of Saint Esprit go back to the original settlement of New Amsterdam. Many of the first European settlers in 1624 were not Dutch, but French Calvinists, who were known as Huguenots. They were also joined by Walloons, or French-speaking Protestants from Belgium. Both of these groups had previously fled to Holland to escape religious persecution in their home countries. By joining Dutch colonists in coming to the New World, they hoped to find greater opportunities to own land and to prosper at their trades. New Amsterdam's early population has been estimated at about 270 persons. During its irst four years of existence, the colony did not have an ordained clergyman. The first one, Jonas Michel, was of French descent and arrived on April 7, 1628. Following the custom of Dutch clergy at the time, he latinized his name to Jonas Michaelius. He began conducting regular services in a room above the village's grist mill on what is now William Street near Pearl Street. Correspondence suggests Michel spoke French rather well and could preach in French after a fashion. It is certain that he began holding regular French services every Sunday afternoon following the morning service in Dutch. The date chosen for the founding of the French Church of Saint-Esprit is somewhat symbolic. In a letter dated August 11, 1628, Michaelius wrote to a colleague in Amsterdam that: …the Lord's Supper was administered to them (the French and Walloons) in the French language, and according to the French mode with a discourse proceeding, which I had before me in writing, as I could not trust myself extemporaneously." Easter Day, 1628, thus became the date chosen to represent the founding of Saint-Esprit. Jonas Michaelius returned to Holland in 1633. For the next fifty years the religious needs of the French-speaking population were met as well as possible by the various Dutch clergymen. From comprising almost a majority in the beginning, the French-speaking segment of New Amsterdam, which became New York in 1664, declined steadily, although it never entirely disappeared. The first wave of persecution against Protestants in France was resolved by the Promulgation of the Edict of Nantes in 1598, which gave legal status to Reformed Christians. As a result, the outflux of refugees slowed. Following a pattern that was to be repeated in the future, the Huguenots who had migrated worked hard, prospered and quickly intermarried with the residents of their new countries. The second and largest influx of Huguenots to the New World began in the last quarter of the 17th century. Louis XIV renewed the persecution of Protestants in a series of harsh repressive measures, which culminated in the Revocation of the Edict of Nantes in 1685 and the determined effort not only to crush all practice of Reformed Christianity in France, but to forcibly convert all Protestants to Catholicism. This tragic and misguided action drove from France hundreds of thousands of her most able and industrious people. This new outflux enriched those countries and colonies which wisely offered them shelter. England was the place of refuge for Huguenots from the maritime provinces of western France: Poitou, Saintonge, anad Aunis. A smaller number came from the rest of France, especially Normandy. From England, thousands of Huguenots then migrated to the colonies in America. Jean Maynard, in his history of Saint-Esprit, estimates that the French Church of New York received about one-quarter of one percent of the overall Huguenot immigration. This small percentage was enough to dramatically increase the French-speaking population of New York. By 1697, according to Dr. Maynard, there were 4,000 inhabitants of New York City and, of that number, about 15 percent were Huguenots. The first independent French Church in New York was organized under the Rev. Pierre Daille who had been a professor at the French Protestant college of Saumur before it was closed by order of the king and its faculty banished. Seeking refuge in Holland, Mr. Daille then went to London where he received Anglican holy orders. He came to America to work with the French and Dutch, not only in Manhattan, but in the surrounding area, going on a regular schedule to Huguenot communities in New Paltz, Staten Island, and New Jersey. In 1687 Rev. Daille was aided by the arrival of the Rev. Pierre Peiret, a native of Béarn in the South West of France. Concentrating on the French of New York while Mr. Daille continued his work in the surrounding area, Mr. Peiret organized the first French congregation to have its own edifice. This small church was located on what was then called Petticoat Lane, later Marketfield Street. Today it is Battery Place between Broadway and West Streets. It was called simply "L'Eglise Française a la Nouvelle York." A second wave of Huguenots came to the New World after Louis XIV's revocation of the Edict of Nantes in 1685. The king made a determined effort to crush all practice of Reformed Christianity in France, and to forcibly convert Protestants to Catholicism. This tragic and misguided action drove hundreds of thousands of France's most able and industrious people from their homeland. This influx of Huguenots to New York was so great that after a few years, Saint Esprit's congregation became too large for their small building on Petticoat Lane. In 1704 a new and larger church was built at the corner of Pine and Nassau Streets. It was called, for the first time, "Le Temple du Saint-Esprit." It was to serve the parish for the next 130 years. This church was a simple rectangular building, 50 by 75 feet. Beside it was a graveyard. There was a wooden fence on the sides which bordered the streets. It possessed a small tower which was surmounted by a cupola. By all accounts, it looked like a small country church. Mr. Peiret died in 1704, before the new church could be completed. His successor, Jacques Laborie, had a brief ministry at Saint-Esprit. Mr Laborie had received teleological training in Zurich before studying medicine in London. He was sent to America by an Anglican missionary society. After assuming his duties as pastor he began to pressure the parish to adhere to the Church of England. When it would not, he resigned two years after his arrival, and moved to Connecticut where, for the rest of his life, he had a rather distinguished career as a physician. Louis Rou succeeded Dr. Laborie as pastor of Saint-Esprit, and served for the next 40 years until his death in 1750. He was an excellent scholar, and widely respected, and he possessed a forceful personality. In addition to numerous volumes of .learned sermons, all being of a length and complexity typical of the period, he also wrote poetry, both religious and secular. He is credited with having introduced the game of chess into the colonies. Thanks to his able leadership and the large number of Huguenots in New York, the parish thrived during much of his long ministry. However, beginning around the 1730s, the membership of Saint-Esprit began a steady decline for several reasons. Huguenot immigration to the American colonies, after the great influx during the period following the Revocation of the Edict of Nantes, dwindled to a small number. Louis XIV died in 1715 and his successors, while still not recognizing the practice of the Reformed religion, did not share his great zeal for persecuting it. French immigrants for reasons of conscience, therefore, were few in the 18th century. Those Huguenots who came to the Americas during the great immigration followed the familiar pattern of working hard, prospering, and assimilating rapidly. Many of them became distinguished in their communities and as they did so, other, larger churches eagerly sought their support and leadership. The lists of English and Dutch congregations in the 18th century are filled with Huguenot names. The children of the immigrants were no longer comfortable worshipping in the French language. Against these counter trends, Mr. Rou struggled with diminishing success. Revenues fell and were not enough to cover expenses. As the size of the congregation diminished, petty issues began to split the remaining elders and members. By the time of Mr. Rou's death in 1750 Saint-Esprit was in a very weakened state from what it had been. There followed the most difficult period in the long history of the parish. Elders and parishioners quarreled constantly and often split into opposing factions. These squabbles became well-known in the general community and, even worse, in the Reformed churches of Europe. Because of this, and the precarious state of the parish finances, no qualified candidate would agree to come to New York as pastor from France or Switzerland. In the absence of a full-time pastor, a succession of lay readers tried to hold things together with little success. By the time of the Revolutionary War, the strength of the congregation had so declined that it had virtually disappeared. When the British invaded New York, they requisitioned the church building as a storehouse for arms and ammunition. Regular worship services ceased for almost 20 years. The revival of Saint-Esprit was the product of a fortunate occurrence in 1795. A Swiss clergyman, J. Louis Duby, passed through New York, became interested in the plight of the French Church, and decided to do what he could. The church building was in a state of dilapidation and could not be used. The French Protestant community of New York was almost non-existent. The Reformed religion had been officially recognized in France by the Edict of Toleration of January 1787, and the refugees during the French Revolution were mostly of the Roman Catholic nobility. Only one elder from former days was still alive. However, Mr. Duby was able to contact a few of the former congregation, enough to form a small group. A notice was put in a local paper asking all interested people to assemble for the purpose of re-establishing the parish. A meeting was held on January 26, and from that small number present a new board of elders was elected. The new elders then applied for incorporation under the laws of the State of New York. Incorporation had never been granted during the colonial era because Saint-Esprit did not belong either to the officially established Church of England or to one of the churches established before English rule, such as the Dutch Reformed Church. There turned out to be more interest in the French Church than anyone had suspected and, encouraged by this modest success, the elders asked Mr. Duby to be their pastor. Planning to return to Switzerland, Duby declined the offer, but he promised to look for a candidate upon his return. True to his word, he found a young man of 30 named Pierre Antoine Samuel Albert whom he recommended highly. The elders issued a call; Mr. Albert accepted and arrived in New York from Switzerland in 1797. He was the last pastor and the first rector of Saint-Esprit. After much discussion, Saint Esprit's members unanimously voted to join the Episcopal Church in November of 1802. In doing so, they hoped to remedy the church's precarious financial situation and to keep in step with New York City's evolving social landscape. This decision by a tiny French Calvinist church, which was characterized by its simplicity, plainness and democratic structure, to join with a much larger denomination which to some evokes elaborate ceremony, aristocratic mannerisms and a "Catholic" hierarchy, merits some explanation. At the time, the decision made sense. The contemporary Episcopal Church in the United States is, in many aspects, the result of the Oxford Movement, which began in England in 1833, 30 years after Saint-Esprit had joined the Episcopal fold. It brought elements of Catholic tradition, liturgy, and doctrine back into the life of the Anglican church, and spread rapidly in both England and the United States. The Episcopal Church of 1802, however, was still much more Calvinist and Protestant in outward aspect than it was to become later, and the elders and members of Saint-Esprit saw no insurmountable obstacles to this union. Other Protestant denominations were rejected by the Saint Esprit's members for reasons which would not be important today. The Dutch Reformed (Collegiate) Church was considered too Dutch, the Presbyterians too Scottish, and the Lutherans too German. The Congregational Church was not represented in New York City. The members of Saint Esprit also remembered the English kings had welcomed French-speaking Protestants in England and the colonies at times when they were persecuted at home. This tradition of warm relations with the Church of England was continued in the United States by the Episcopal Church after the Revolutionary War. Several of the pastors of Saint Esprit had possessed Anglican ordination, and in the past, when the children of the Huguenot refugees joined American churches, they tended to go to the Church of England. The Episcopal Bishop of New York at the time, Dr. Benjamin Moore, was impressed by Pierre Albert and enthusiastically encouraged Saint Esprit to join the Diocese of New York. There was the added inducement of the Des Brosses legacy. In 1773, Elias des Brosses, a Huguenot who had become a vestryman of Trinity Church, Wall Street, made a will shortly before his death in which he left a thousand pounds, to be administered by Trinity Church, for the maintenance of a French clergyman who "shall perform Divine Service in the French Language according to the liturgy of the Church of England." At the time, this money was badly needed by Saint Esprit. However, Saint Esprit's most compelling financial reason for joining the Episcopal Church was not the Des Brosses endowment. It was the fact that in those days, churches were supported by the rents charged to those who bought pews, and since so many descendants of the former members of Sain -Esprit had become Episcopalians, it was hoped that these people would, out of loyalty, buy pews in Saint Esprit now that it was part of the Episcopal Church. So, on Whit-Monday, 1803, Bishop Moore consecrated the little church at Pine and Nassau Streets as an Episcopalian house of worship. The following day, he ordered Pierre Albert to the diaconate, and three weeks later, to the Priesthood. Almost all the pews were soon bought, membership grew, and Saint Esprit was well along on its path of recovery. Unfortunately, Pierre Albert died in 1806. For the next ten years, the vestry searched for a suitable replacement. Their search for a replacement from Europe was made more difficult by the fact that the region was embroiled in the Napoleonic wars. Finally in 1816, after many letters and disappointments, a clergyman from Neuchâtel, Henry Penevyre, accepted a call to come to New York. He was ordained into Episcopal orders by Bishop Hobert and for 10 years had a successful ministry at Saint Esprit. Under his leadership, the parish consolidated its gains in membership and, finally, was able to exist on a firm financial footing. Mr. Penevyre was well-respected in the community and was honored by a doctorate of divinity. In 1826, Mr. Penevyre, growing older, resigned in order to return to Switzerland. Before his departure, he corresponded with various theological faculties in his native land to arrange for his successor. The most outstanding candidate was a young man named Antoine Francois Verren, aged 24. He had been an excellent student at the Theological Academy of Geneva and was currently ministering in Marseilles, his native town. The vestry issed a call; Mr. Verren accepted, and arrived in New York in August of 1827. He was to be the rector of Saint-Esprit for the next 48 years. Antoine Verren had the distinction of having officiated in three different church buildings and of having erected two of them. His long ministry covered a period when the city of New York was experiencing tremendous growth. 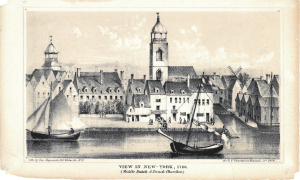 Among the multitudes of immigrants who poured into New York were many French and Swiss Protestants. They greatly strengthened the parish. By the time of Dr. Verren's arrival, the neighborhood around the old church building at Pine and Nassau Streets had turned almost completely industrial. The residential neighborhoods were moving rapidly north. The building and property were sold in 1831 and a new church, designed in Greek revival style by the noted architects Town and Davis, was constructed at the corner of Church and Franklin Streets. It was simple yet elegant and it was greatly admired for the beauty of its design. However, the northward advance of the residential areas of Manhattan was so rapid that, fewer than 30 years later, the neighborhood around the church had become almost completely commercial. The French section had moved northward on the West side. So in 1862, the property was sold and a new church was constructed at 30 West 22nd Street. Unfortunately, in accordance with prevailing taste, the new church was designed in an undistinguished neo-gothic style. It was to serve the parish for less than 40 years. After a long and distinguished ministry, Antoine Verren died in March of 1874. The vestry called as rector the Rev. Leon Pons, living in Troy, New York. He served for only five years. It seems that his personality was not as strong as Dr. Verren's and that he suffered the inevitable problems of a newcomer arriving after a long tenure of his predecessor. After five years, Mr. Pons decided he would rather be a full-time professor of French and so he resigned to accept a teaching position. Fortunately, a young Lutheran clergyman, born in Alsace but receiving much of his theological training in the United States, named Alfred Wittmeyer, wa available to succeed Mr. Pons. Called as rector in 1879, he was ordained to Episcopal orders by Bishop Horatio Potter. He was to be rector for the next 46 years. Mr. Wittmeyer was an ideal choice for Saint-Esprit. He was equally at home in both French and American cultures. Wittmeyer's ministry lasted almost as long as Dr. Verren's, and paralleled it in many respects. Both came as young men to Saint-Esprit and stayed there for the rest of their lives. Both were of strong personality and gained wide respect in the community at large. Both were competent leaders and Saint-Esprit thrived at the height of their ministries. Both had to cope with declining membership toward the end of their tenures as rector. Mr. Wittmeyer had a remarkable talent for business and put the parish on a sound financial basis. The church property on West 22nd Street had become quite valuable. He was able to sell it, purchase a new location at 45-57 East 27th Street, build a new and larger church there (unfortunately also designed in a mediocre neo-gothic style) and have a profit left over. One of Mr. Wittmeyer's most enduring contributions was his leadership in the founding of the Huguenot Society of America in 1883. He was its secretary and guiding light for 15 years and he worked tirelessly to bring together Americans of Huguenot descent in order to foster in them an appreciation of their ancestors. Led by his example, the Huguenot Society became a source of strength for Saint-Esprit which continues to this day. This page is still being written. Contact us for information specific to this century. Tom Wile was the first rector of Saint Esprit not born in Europe and, with the possible exception of Leon Pons, the first to have been ordained to the Episcopal priesthood prior to his association with the parish. At the time he joined Saint Esprit as Vicar, Sunday attendance ranged between 12 and 61 souls. Wile was occasionally assisted in his sacramental duties by Chaurize and Marie-Louise Sherwin, a psychiatrist who was ordained at Saint Esprit in 1978. At the suggestion of Bishop Moore, Wile became a part-time Rector for three years in 1982, and his contract was repeatedly renewed until 1987. Besides its regular Christian celebrations, the parish also commemorated dates related to its Huguenot and francophone heritage, such as a Huguenot Society Day and Bastille Day. In 1978, Saint Esprit celebrated its 350th anniversary with an official visitation by Bishop Moore, followed by another service led by Wile a few months later, attended by 132 people. In December of that year, a Dedication of Shields service brought 78 people to Saint Esprit, including the families whose coats of arms were represented on the shields that had been hung in the church sanctuary. Being an artist, Wile was intimately involved with designing elements within the church interior. He was behind the newly designed window in back of the altar, containing a Huguenot cross of stained glass to be placed in the center panel and a medallion of the seal of the Huguenot Society on one side pane and the seal of Saint Esprit on the other; these windows were dedicated at a special service in 1984 and can be viewed in the sanctuary today. He also proposed a design for new glass front doors to the church, increasing their size, widening the entryway and installing new brass lighting fixtures. A new flagpole and organ arrived in 1985, and new pew card holders included cards for visitors and new members to fill out. Also in 1985, Reverend Wile presented a new brochure about Saint Esprit’s history that he had written and illustrated himself with drawings of the new altar windows, the new organ and new front doors. His brochure is still used today. Several notable acts of Christian outreach during this time demonstrated the parish’s desire to build its charitable mission. In 1986, a winetasting was organized in an effort to get the parish involved in supporting worthy causes; the funds raised went to the Huguenot Society’s scholarship fund. A fund named after a Saint Esprit warden, the Darlington Fund of the American Bible Society, donated 70 new French Bibles to Saint Esprit. In 1987, the church raised $600 at a concert and wine and cheese party in order to sponsor several children or Saint Esprit members at the Church of the Incarnation’s summer camp. Despite its regular services, improvement projects, faithful leaders and members, Saint Esprit suffered from a debilitating lack of staff and programs. In 1979, a vestry discussion on charitable contributions concluded that the church did not have sufficient staff or income to properly carry out a broader urban ministry, and that the Diocese could more effectively use the parish’s funds. In 1986, responding to the Rector’s suggestion that the parish establish its own pastoral programs, the vestry decided not to embark on these but to continue to support the pastoral, charitable and educational programs of other organizations. The same year, a proposed weekly vesper service ran for a few months and then was tabled. It is not surprising, then, that efforts were made to combine Saint Esprit’s worship life and operational management with other churches. In 1980, a joint communion service was to be held first at the French Evangelical Church on West 16th Street followed by one at Saint Esprit, but the 16th Street’s pastor felt that very few would attend a Sunday afternoon service at Saint Esprit and would not consider holding such a service. In 1984, announcing his desire to retire the following year, Reverend Wile urged the Vestry to consider a future shape for the parish’s ministry and the duties of the future Rector before seeking a new one. Over the next year, discussion ensued on the parish’s strengths and weaknesses, ways to enhance its ministry and determine its objectives. Consideration was given to having the 16th Street church’s pastor take charge of Saint Esprit’s pastoral work and arrange for Episcopal priests to administer Holy Communion. At the end of the day, the Rector’s contract was renewed until December 1987, at which time he left with the good will of the parish, who threw a luncheon party for him in honor of his ministry. The Reverend L. Dickens Célestin served as a temporary substitute from January to April 1988, when the newly chosen Rector of Saint Esprit, the Reverend Dr. Jacques Bossière, came to deliver his first sermon on the seven last words of Christ on Good Friday. Célestin would return as an occasional supply priest for Bossière. The Reverend Dr. Jacques Bossière had been an assistant at the American Cathedral in Paris, and accepted a call to a three-year Rectorship at Saint Esprit. Unlike previous priests, he was provided with an offsite apartment as the rectory was considered to be too small for his family. He was officially installed in February 1989, during a pastoral visit by the Bishop attended by 70 people. The church benefited from several beautification projects, such as brass pots for the altar flowers, evergreen trees outside the church entrance, and an exterior glass-enclosed board announcing services. A June 1989 Red Book entry noted that “Today we received as a gift a superb crucifix made of brass” and, in a separate entry in June, that the 1803 chalice and cruet were being used for the first time. New baptismal fonts were blessed, and the parish held a reception for the first time the new pascal candle stand was used. The church also rediscovered its plot at Cedar Grove Cemetery and held discussions on its future use. Reverend Bossière was well-connected in Parisian circles and brought greater cachet to Saint Esprit, attracting a well-heeled crowd and inviting guest celebrants and preachers from neighboring churches such as Bon Samaritain, All Saints, the French Evangelical Church on West 16th and Diocesan officials such as the Archdeacon. Bossière made several visits locally or abroad, to New Paltz, New Rochelle, the Anglican Communion’s Lambeth Conference, and Versailles and Paris to represent Saint Esprit at the Commission des Eglises Evangéliques d’Expression Française à l’Extérieur, an arm of the French Protestant Federation. Most importantly, he founded a new international association, Rencontres, which offered various types of support to French-speaking Anglican and Episcopal dioceses, especially in the Third World. Charitable outreach was a cornerstone of Bossière’s ministry. In 1989, the Outreach Committee reported to the Annual General Meeting that the Rector had so far in 1989 raised over $10,000, with commitments made organizations in India, Zaire, to Rencontres, to AIDS research, to Incarnation’s summer camp, the Episcopal Mission Society’s South Bronx project and the Haitian congregation in New York. The Rectors’ Discretionary Fund also was subsequently increased. Bossière initiated a Christmas Drive fundraiser letter, calling upon Saint Esprit members twice a year, rather than canvassing for pledges, to help with the church’s needs distinct from donations to its charitable outreach program. Besides his own efforts, one lay leader designed the artwork for Saint Esprit Christmas cards whose proceeds would benefit the church’s needs. Alas, a dispute broke out in the Spring of 1990 between the Rector and a majority of the Vestry, and May 23rd, 1990 was Bossière’s last service at Saint Esprit. A settlement was reached for his departure and he was granted the title of Rector Emeritus. From this Sunday onwards, weekday meditations and weekly AA meetings ceased. The church reverted back to Sunday morning 11:00 am services, with a number of supply priests ensuring continuity through the end of 1990. In the fall of 1990, the search for a new Pastor began. Perhaps feeling wounded by the disputes with its Rector, the Vestry decided to change its Bylaws to provide for a Pastor, or Vicar, instead of a Rector and to reduce from 8 to 2 years the time a Pastor must serve before being eligible as as Rector. The Diocesan Deployment Office reported that only 2 of the 23 local French-speaking priests contacted had sent in positive responses, and the Search Committee expanded its search to a wider area. Although earlier that spring the church leadership had met with officials at Trinity Church to discuss its taking over Saint Esprit’s management operations, the parish appeared to regain its footing when the Reverend James Harkins arrived as spiritual leader. In September 1991, the Reverend James Harkins was called for a two-year contract as Vicar, which he accepted in December. His first service in November 1991 marked a nearly two-year run of steady services by the same priest. He decided to hold two Sunday services – 9:30 am and 11:00 am – which began in January 1992 and continued until his departure in 1993, accompanied by more frequent Holy Communion than the once-monthly practice of his predecessors. Services also began on Wednesdays at 12:15 pm in April 1992. That December, a service was held to commemorate Reverend Harkins’s 40th anniversary as a Priest. Reverend Harkins’s period of ministry, being short, was relatively uneventful. The church allocated $5,000 of its Outreach Program to be disbursed at his discretion, and allowed him to purchase new candelabra and cabinetry for the church. His tenure could be characterized as a relatively smooth transitional period before the church sought a more permanent spiritual leader. By September 1993, this transition was already being prepared with the vestry reaching out to potential replacements. One candidate, the Reverend Nigel Massey, joined Harkins on September 5, 1993 to preach as Harkins celebrated. October 31st was officially deemed a “farewell” service for Reverend Harkins. From October 31st of 1993, the church once again changed back to Sunday 11:00 am services only, with several guest and supply priests covering the parish for nearly a year. One supply priest, the Reverend Auguste Pluviose, covered services from December 1993 all the way through to October 2nd, 1994, date of the arrival of the Reverend Nigel Massey. Reverend Massey had already preached and celebrated at Saint Esprit in October 1993 and again on Huguenot Sunday 1994 and on October 2nd with Auguste Pluviose. He began full-time with the October 9th service. In the Fall of 1994, the vestry of Saint-Esprit called Nigel Massey to be Pastor. Born in Staffordshire, England, he grew up on the island of Cyprus and studied Egyptology and Hieroglyphics at Birmingham University, England before going on to study theology at Oxford. Upon ordination he joined a parish in Birmingham, then went on to work for the Board of Mission and Unity of the Church of England, researching into Christian / Muslim relations in France. After returning from France to work for the Bishop of London as advisor to the Diocese on relations with people of other faiths, he came to Saint-Esprit. Reverend Massey discovered what was essentially a chapel that needed to be transformed into a church: its membership had diminished severely and consisted mainly of French expatriates living in New York, American francophones and francophiles interested in attending services and activities in French, and parishioners of Huguenot descent and members of the Huguenot Society of America who found it meaningful to worship in the sanctuary of their ancestors. It was not uncommon to find less than 10 people in the pews on a Sunday. Under his prayerful and devoted leadership, the church began to blossom as new activities brought new members and a fresh spirit and mission. Free French classes on Sunday mornings brought many new people interested in learning French, some of whom continued on to attend services and became part of the congregation. In 2002, a weekly Bible study group began delving into the weekly lectionary readings in preparation for Sunday sermons. In 2004, staged readings in French and English that grew as an offshoot of the French classes developed into the founding of the Little French Church Players, a theatrical troupe that has staged performances in the sanctuary and elsewhere at least twice a year. In ____, a group of pilgrims meeting weekly to pray in the Taizé style began meeting every Thursday evening at Saint Esprit, deepening the spiritual and prayer life of the church and holding Taizé prayers on Sunday four times a year. The founding of these new groups has been accompanied by a number of projects that have strengthened the life of the parish. A hymnal project is nearing completion, that seeks to gather in one volume the hymns dear to Huguenot ancestors and French-speaking countries around the world, many translated to French for the first time. Capital improvements have maintained and beautified the church’s infrastructure and in 2009, the sanctuary was completed renovated and a new organ installed. Twice-yearly visits began to Saint Esprit’s cemetery plot in Flushing, Queens, with prayers and hymns in memory of those who have passed on recently or in distant memory. In addition to these special interest groups, the Church continues to celebrate important days in the Christian calendar as well as special events of interest to this rejuvenated community: Bastille Day, Oktoberfest, Rentrée Sunday and Afrique Fete. New groups, new activities and many prayers and the work of the Spirit resulted in an explosion in membership in the early 2000s, accompanied by a demographic diversification as francophones from outside France, most especially Haiti and French-speaking Africa, were welcomed with open arms at Saint Esprit. This has brought new opportunities for this special parish to serve as a resource to the broader church and wider community in ways unique to the history and faith of its founders. New ministries at Saint Esprit have developed to serve newly arrived immigrants, asylum seekers and refugees, much as our Huguenot ancestors did nearly 400 years ago. The presence of these people, from all walks of life, is a living testimonial not only to the mighty contribution of the Huguenot refugees who came to these shores but also to the longevity and ongoing witness of their church, which continues to proclaim and to keep alive the faith of its founders. Huguenot descendants gather every year with the regular congregation on Huguenot Sunday, to worship as their ancestors did, to sing the hymns that they sang, and to honor the faith and courage of their forefathers. The liturgy of the Book of Common Prayer, in French, is still celebrated each Sunday morning. French hymns are sung, many of them the same ones sung by the Huguenots of Saint-Esprit over 300 years ago. On the walls of the chapel are the coats of arms of many Huguenot families, a constant reminder to present-day worshipers of their heritage. The Huguenot cross and seal of the Huguenot Society adorn the stained glass behind the altar. The beautiful silver chalice, paten, tankard, and baptismal bowl, given to the parish at the beginning of the 19th century, are still used at festival services.